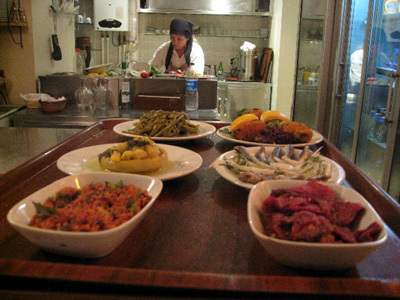 Sometimes billed as “that Armenian-Jewish restaurant in Beyoğlu,” Mekan harkens back to the neighborhood’s cosmopolitan past, when it was home to a large non-Muslim population. 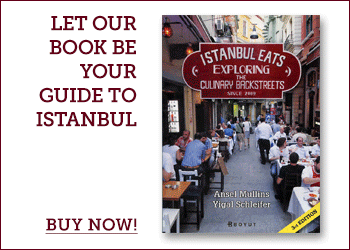 The food is sometimes Sephardic and Armenian, sometimes Turkish. But the important point here is the place’s authenticity. Mekan is not trying to be anything but a good restaurant with a kitchen turning out traditional favorites that it knows best. Hold the culinary nationalism, and dig in. From the moment you enter, you’ll be ensconced in the warm, personal handling that is an integral part of the Mekan experience. The gracious owners are often standing by to greet new arrivals or working the room with a glass of wine in hand, as if they were hosting a dinner party in their home. A bottle of the house red wine is a good way to start the meal, and at roughly $20 a bottle this is one of the most affordable (drinkable) wines in town. 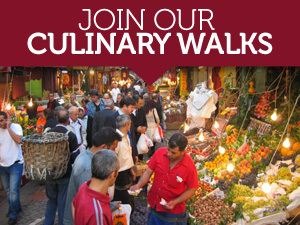 If you are lucky, Mary, the boisterous chef, will make an appearance along with the meze tray. On a recent visit, she took one look at us and immediately saw in our future the pickled mezgit (silver hake), an ultra-fresh tomato salad with crushed walnuts that was dressed with pomegranate molasses, and a plate of smoked red peppers in a thick, sour yogurt. We also went for the topik, an Armenian specialty that stuck out on the meze tray like a sore thumb, or, more accurately, a softball. Made with chickpeas, potatoes, tahini and onions that are mashed together and turned into a mound that is then studded with pine nuts and dusted with cinnamon, this sweet and savory concoction is an odd assembly of flavors and textures, to say the least. It is a novelty that people either hate or write folk songs about, but should be tried at least once. Following the mezes comes the ara sıcak, or hot appetizers course. From this round we suggest the içli köfte, better known as kibbeh in Middle Eastern restaurants. Mary’s courage to ramp up most dishes with a bit more spicy heat than usual came through on this dish. Its color alone, a deep crimson, spoke of the paprika kick within. Patlıcan börek is a Mekan specialty from the Sephardic kitchen that is not to be missed. In place of the cheese, spinach or potato that most börek is filled with, this börek’s crispy phyllo dough shell holds a smoky eggplant mash. To the veteran börek eater, this is at first alarming and, shortly thereafter, extremely pleasing. Entrées at Mekan tend toward a simple preparation, mostly from the grill. Köfte, meatballs, or a fresh fish are always around. When they’re on offer, we opt for a plate of hamsi, Black Sea anchovies, in corn meal cooked on a lightly oiled flat griddle. The preparation does this small fish justice and is presented in a perfect fan shape on the plate, as if 20 little fish were attached at the tail. Mekan’s uncommon ethnic specialties, served in a quiet atmosphere, present a nice change of pace to the predictable menus and raucous surroundings that mark most dinners out in Beyoğlu’s meyhanes. Though the price of a dinner with alcohol doesn’t differ much from its competitors, the quality of the food, wine and service keep us coming back for more. Nice review, but some info on food (rather than just wine) prices would be most welcome! Thanks for writing. We plan to incorporate that kind of information into future reviews. We realize that would be useful for readers. Thank you so much for the interesting reviews. We went to Mekan tonight and really enjoyed it. The owner and/or hostess was very friendly, the food was great and not too greasy. It is a shame that we have to go back to Canada tomorrow, as I would love to try out more of your recommendations. We ate there last week. The mezes were good. The main courses were distinctly average. But I wouldn`t want to put anyone off from trying it out. The welcome was exactly as you describe – very friendly indeed – and that counts for a lot. Anyone know if this place has changed hands since it was reviewed? I planned to eat there last weekend with some friends but we changed our mind after looking at the decidedly uninspiring-looking menu featuring a mix of salads, kebabs, pastas, and some basic mezes. Fortunately always-faithful Ficcin was nearby! Hmmm….we’ll swing by there and see if something has changed. 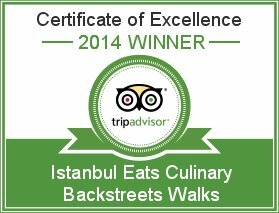 Our favourite place in Istanbul! The a la carte menu is not very impressive, but the fixed menu with 10 meze for a start was brilliant. Lovely people that owns this place.